TICKLESS® Mini Cat effectively protects your cat from ticks and fleas without chemicals. This small yet powerful device emits a series of ultrasonic pulses that disorientate ticks and fleas but harmless and imperceptible for people or pets. TICKLESS® Mini Cat features cutting edge design, with all-inclusive protection for your cat in the city bushes. Easy-to-use: simply fix it onto the collar with the attached silicone band – the superstrong fastening ensures the device securely stays on. The rechargeable battery ensures long time operation. Because she deserves the best. TICKLESS® Mini Dog is the new generation of ultrasonic flea and tick protection. Stronger, more effective yet this is the smallest ultrasonic repeller on the market today. Cutting edge design, with all-inclusive protection for even the smallest pets in the city or out. Oh, and it’s also rechargeable so you can protect your loved ones longer! The device emits a series of ultrasonic pulses that are imperceptible to pets or humans, but interfere with the ability of ticks to orient them-selves, thus keeping them away. Eco-friendly, contains no chemicals or fragrances, perfectly safe to use. Tickless & MiteLess -Infinity Trade Kft. 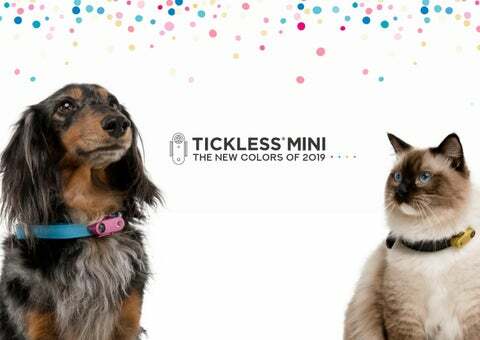 See the new colors of Tickless Mini!